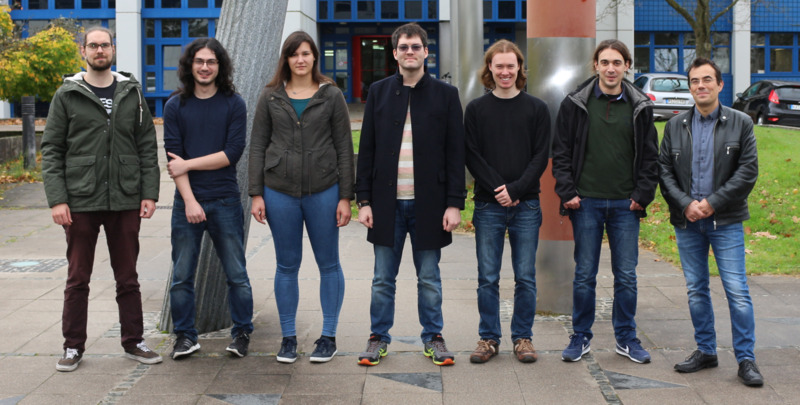 On photo from left to right: Matthias Schweizer (diploma student), Ulaş Ören (diploma student), Laura Scheuer (diploma student), Sascha Keller (PhD student), Philipp Lang (diploma student), Dr. Spyridon Pappas (postdoc), Jun.-Prof. Dr. Evangelos Papaioannou (head of the group). -Spintronics/THz spintronics: Our aim is to control the magneto-electric spin conversion in magnetic heterostructures by means of atomically controlled interfaces. We focus on the spin pumping effect, spin Hall effect and inverse spin Hall effect for the generation and conversion of spin accumulations and pure spin currents. -Spin-plasmonics: our goal is to bring together the fields of Magnonics and Plasmonics. We investigate the emergent properties due to interactions between two collective excitations: plasmons (induced by optical near fields) and magnons. We aim on: (i) the manipulation of magneto-plasmon interaction i.e. the manipulation of surface plasmon properties through the use of magnetic materials and external magnetic fields; (ii) the manipulation of magnon properties by using localized and propagating surface plasmons. To achieve our goals, we use our expertise in materials science and in magnetization dynamics. We focus on the epitaxial growth of thin films and multilayers by molecular beam epitaxy and sputtering techniques. The structural and magnetic properties are studied via in-situ structural (LEED, REED, STM) and in-situ magnetic (MOKE-BLS) characterization techniques. Furthermore ex-situ techniques like XRD, XRR, AFM for the structural part and BLS, Spectroscopic-MOKE, FMR, Angular resolved spin pumping, MFM for the magnetic part are in our disposal. DFG SFB/TRR 173, Project B07 "Spin+Magnon-Control: Controlling interactions between magnons and plasmons"